Marko Siitonen, PhD, is an associate professor at the Department of Language and Communication Studies, University of Jyväskylä, Finland. He approaches game studies from a social interaction viewpoint, with an emphasis on emergent communication behavior in player communities. This paper examines player-to-player interaction in Hearthstone: Heroes of Warcraft (Blizzard Entertainment, 2004). The game designers have attempted to limit what they see as negative interaction by forcibly limiting player-to-player social interaction. 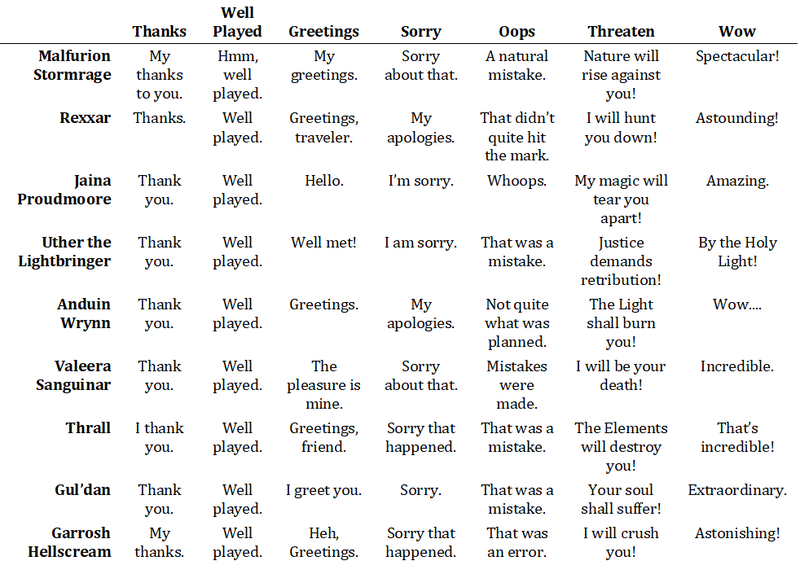 Based on an analysis of forum discussions, this empirical study illustrates how players utilize Hearthstone's restricted communication affordances for negative and insulting purposes, and how players negotiate their shared symbolic reality concerning this type of interaction, labeled "Bad Manner(s)" or "BM". The continuous debate over an issue which ultimately cannot be solved shows that players care deeply about the game and the surrounding culture. This study contributes to our understanding of player-to-player communication, and offers insight into game design from a social interaction point-of-view. By doing so, it connects with the larger questions of emergent negotiations of meaning related to human communication behavior in technology-mediated settings with designed limitations on communicative affordances. Multiplayer games have been available since the early days of networked computers. In 1980, players of MUD1 (Trubshaw & Bartle, 1978) could connect with other players over the ARPAnet and play with others over the predecessor of the Internet. Since the first games were text-based, all in-game communication occurred by sending strings of text over the network. Since then, long distance communications have become more diverse. Contemporary online games often include support for voice communication, and feature rich graphical user interfaces and virtual worlds. This development has enabled aspects of nonverbal communication such as kinesics and proxemics to become a prominent feature of the communicative affordances provided by online games (Yee, Bailenson, Urbanek, Chang, & Merget, 2007). For example, already in the early 2000s, massively multiplayer online games (MMOGs) could feature hundreds of "socials", commands that allow players to enact various types of nonverbal behavior (Ducheneaut, Moore, & Nickell, 2007). Later this type of virtual body language (Ventrella, 2014) has developed into allowing players to push other players' characters around or block their path much like in the physical reality. While a lot of work has gone into enabling new ways of communication, designers have occasionally focused their efforts on restricting player communication. A prime reason for this restriction is the awareness that anonymous communication over the internet leaves plenty of room for antisocial behavior, from harassment and trolling to language unsuitable for minors (Chui, 2014). Restricting communication in a multiplayer game can also work as a game mechanic, or as a way to emphasize the storyline or atmosphere of the game. For example, in the highly popular MMOG World of Warcraft (Blizzard Entertainment, 2004), players representing different factions cannot communicate verbally with each other. What this restriction means in practice is that communication between factions is scrambled by a computer code. This design choice was made during the testing phase of development, since in the early days of beta testing both "sides" in World of Warcraft could speak to one another. Players can choose to communicate nonverbally, but this is naturally restricted by the options available in the game. As (MacCallum-Stewart, 2009) points out, this design choice works to create a narrative tension between the two factions. Another example of restricting communication can be found in Journey (Thatgamecompany, 2012), where two players are paired together randomly over the internet. They may help each other to complete the game's levels, but have no way of communicating verbally besides having their character sing a tune. The players stay anonymous throughout the game. This design choice has been claimed to necessarily afford positive interactions, since players can either help each other or not interact at all (Vanderwall, 2013). Even when communication between players has been restricted as a design choice, if a game depends on multiple (human) actors, it will contain some type of player-to-player interaction. This, in turn, opens up a window of opportunity for social interaction to emerge. Walther (1993) argues people, in the manner proposed by Social Information Processing theory, will in time adapt to the limitations of computer-mediated communication. However, predicting exactly how people adapt is both difficult and almost impossible. This tension between scripting versus emergence is a well-known aspect related to game design (Sweetser & Wiles, 2005). Put simply, emergent player behavior may end up being very different to that intended by the game designers. Players may, for example, "misuse" game mechanics or structure in unintended ways to cause distress to other players – an activity known as griefing (Warner & Raiter, 2005). In this paper, we analyze the relationship between design-choices and emergent, negatively loaded player behavior by examining one example of designers restricting player-to-player communication – that of the collectible digital card game Hearthstone: Heroes of Warcraft (Blizzard Entertainment, 2014). 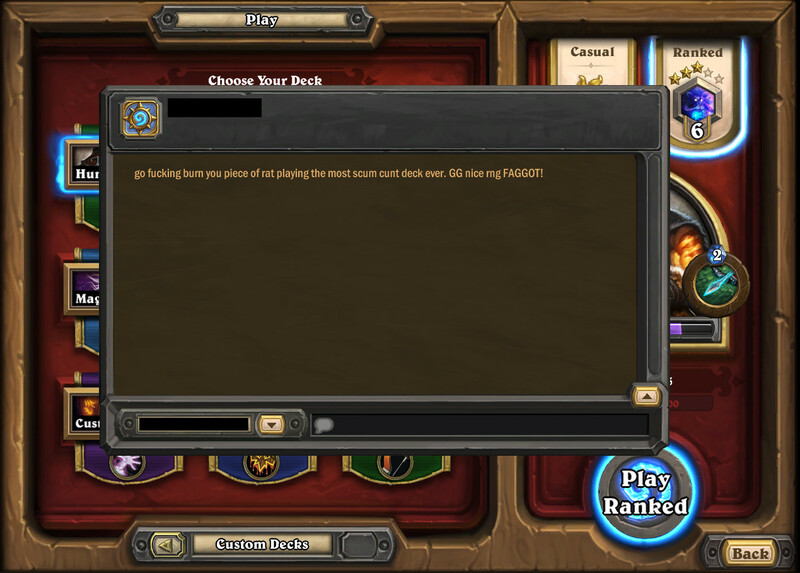 Negatively loaded player behavior in Hearthstone is often discussed in terms of "BM" of "Bad Manners", a catch-all term for anything the players view rude, unsportsmanlike, or against the etiquette of the player community (Myers, 2010). Focusing on BM offers an interesting avenue into understanding the tension between design choices and player-driven emergence. The next two sections prior to the empirical study offer descriptions of the game as well as its communicative affordances. Hearthstone is a digital collectible card game developed by Blizzard Entertainment. It entered open beta in January 2014. The game was officially released two months later, and can be played on both personal computers and mobile devices. It quickly grew a player base of tens of millions of players (Blizzard Entertainment, 2017). Hearthstone uses a free-to-play business model, allowing anyone to play the game, but providing opportunities to spend money by buying packs of randomly selected cards, participating in the Arena, a draft-like format where players build decks from a random selection of cards, or purchasing cosmetic add-ons. While it is possible to play Hearthstone against a computer-controlled opponent, the game focuses on one-on-one matches between two human players. Players compete against one another in competitive and casual game modes. The games have two possible outcomes - either one player wins and the other player loses, or in some rare cases the game ends up as a draw. Players begin by choosing one hero from a selection of nine. Players then construct a deck of 30 cards from the available pool of cards. Typical to collectible card games, there is a constant influx of new cards, with hundreds of cards being added to the pool yearly. Each hero has unique cards that are only available to them. Players can also choose from a range of neutral cards, available to all heroes. Any player may construct decks with all nine heroes. Unlike some of the large-scale game series where yearly versions and development teams of hundreds of people or several studios are the norm, Hearthstone started as a very small enterprise, with only a handful of people making the initial decisions. This enables researchers to have a clear idea of the intentions of Hearthstone's designers and to compare those intentions with the outcomes. Among the designers' original intentions were the ideas to make the game as accessible as possible, and making it easy for novice players to pick up (Hearthtable, 2013; Fluxflashor, 2015). The designers also emphasized how playing the game should be fun – regardless of whether one wins or loses. The designers' intent can also be inferred from the way they continuously weaken (or very rarely strengthen) certain cards in the game. Typically known as "nerfing", this act of weakening cards is often done with the explicit purpose of "keeping the game interactive". In other words, the developers have been known to discourage or disable strategies that are too effective at winning, or do not let the other player to react, such as in the case of one-turn kills. It is evident the designers wish for active interaction between players - just not any kind of interaction. What separates Hearthstone from many other multiplayer online games is the way it restricts player-to-player communication, during a match, to a series of predetermined expressions, known as 'emotes'. These expressions form a restricted language for communicating the complex reactions and emotions players may have during play. The next section will offer a more detailed explanation of the emote-system in Hearthstone. The emotes seen in Hearthstone represent a type of scripted nonverbal communication that can be traced back to early Multi-User Dungeons (MUDs) and similar text-based systems (Curtis, 1996). Typically simulating nonverbal behavior, emotes may appear as textual descriptions of gestures or expressions. Emotes and similar conventions of computer-mediated communication have been seen operating as surrogates for nonverbal communication due to their ability to convey mood, humor, and emotions in general (Peña & Hancock, 2006). An earlier Blizzard game, World of Warcraft (Blizzard Entertainment, 2004), uses predetermined emotes in addition to a free text chat in a manner very similar to MUDs (Mortensen, 2006). Figure 1. The original six emotes in Hearthstone (click to expand). Patch 5.0.0 revealed a 'Wow' emote replacing 'Sorry'. One further emote tested during the alpha stage of the game's development, 'Lucky', was removed from the game because, "it was used for evil more than good" (On, 2014). The developers discussed the emote-system as a way of making sure that players do not have negative experiences when playing the game online and communicating with other players ("Hearthstone - Rating, Social and Balance Interview", 2013). There were also initial plans to add a 'Good Game'-emote to the game, but eventually the developers decided against it, because 'Well Played' was deemed almost functionally identical (On, 2014). The text is standard across heroes, but their verbal expressions are not. This means that each hero will express an emote using different voices, words, and tone from the other heroes. Table 1 presents the verbal expressions of the original six emotes as well the the 'Wow' emote for the nine standard heroes. Since Patch 2.7.0.9166 June 15, 2015 there have been cosmetic alternative heroes available, with game mechanics identical to the original nine, but with different verbal expressions and voice acting. During certain events, such as holidays, the standard emotes have been replaced by seasonal greetings, but they are not, for simplicity's sake, included in the listing here. Finally, playing certain cards allows the player to exchange their hero for a functionally and esthetically different one during the game. Each hero also has lines that they will say in reaction to certain events in the game. For example, heroes will make a comment when the game begins or in response to the player trying to choose actions that are currently unavailable (trying to play a card without the available mana, trying to attack twice with the same minion etc.). Many of these lines are only visible to the player who controls the hero, and do not appear on the opponent's screen. Players can 'Squelch' their opponent. This hides all the emotes their opponent uses. The player who has been squelched has no way of knowing the other player does not see their messages any more. In many ways, squelching is similar to 'gagging' which was introduced in the early text-based online games such as MUDs (Curtis, 1996). It is also similar to the 'muting' or 'ignoring' feature present in most online discussion software. Players can sometimes follow each other's actions by following where their cursor (or finger in the case of touch-screens) is currently positioned. For example, animations in the user interface let players see when their opponent is going through their cards or choosing targets for spells. It is also possible for a player to send a friend request to a player they have recently played with. If the request is accepted, both players add each other to their 'friends' list and can initiate text conversations. 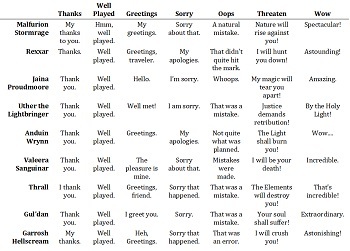 how players negotiate their shared symbolic reality concerning this type of interaction in the communication spaces surrounding the game itself. We base the analysis on data collected from a major online forum dedicated to discussing Hearthstone. Since Hearthstone does not allow larger groups of people to discuss play-related matters, it was necessary to search for other venues where this type of conversation might take place. For this purpose we turned to forum discussions (Philippette & Campion, 2013). Observing forum discussions enables the analysis of naturally occurring communication between users. Approaching forums as discursive tools allows for researchers to develop "... in-depth insight into people's opinions, expectations, and motivations concerning the phenomena (e.g., gaming) under study" (Griffiths, Lewis, De Gortari, & Kuss, 2014). We begun data collection by surveying three English-language forums dedicated to Hearthstone. These were (a) Blizzard's official Battlenet forum, (b) Hearthpwn, which is the largest unaffiliated hobbyist forum, and (c) Liquidhearth, which represents a newer forum more oriented towards competitive play. Altogether these forums have hundreds of thousands of users (Hearthpwn alone had more than 500,000 users at the time of data collection) and millions of messages. Initial searches on all three forums showed that Liquidhearth was very limited in its discussion of BM, and was thus excluded from the analysis. Battlenet forums returned thousands of hits, but due to the way the forum search operates, one thread could turn up multiple times as slightly different historical versions. Thus, the actual number of fitting threads and messages was practically impossible to discern. Ultimately, we decided to concentrate on Hearthpwn, as it is both a major hub for player activity and not controlled by the game's publishers. The data were collected during June, 2015 and cover activity on Hearthpwn from October 2013 to June 2015. We were interested in those discussion threads that dealt specifically with griefing, which in the context of Hearthstone is typically called "Bad Manner(s)" or "BM". We used the keywords 'BM', 'Bad manner', 'emote' and 'squelch' in order to focus the searches on the idea of BM  and communication around it. We restricted the search on to the title lines of threads to ensure that the discussion was focused on BM as a subject matter. The phenomenon of BM appeared in threads dealing with other topics as well, but since our purpose was not to present quantitative characterizations concerning the prevalence of this type of talk, but rather explore how players negotiate meanings related to so-called bad manners, this choice allowed us to focus on the issue of BM itself. After these steps we ended up with a data set of 332,243 words of discussion in 76 different threads, including contextual metadata like discussion thread information. "BM" was among the most used words in the data, second only to metadata words (e.g, 'forum') and common prepositions (e.g, 'in', 'to'). We used thematic analysis (Guest, MacQueen, & Namey, 2012) to analyze the data. Since our focus was on how players negotiate issues related to BM, we did not have a theoretical framework that would have determined our categories of analysis a priori. Our analysis was therefore wholly data-driven. We used qualitative data analysis software (ATLAS.ti) to conduct the analysis. The two co-authors and one assistant conducted the analysis. We did the coding individually, but periodically sat down to discuss the development of the codebook and the coding process in a form of subjective assessment (Guest, MacQueen, & Namey, 2012). The final coding was a result of merging individual coders' work together. This was done automatically in ATLAS.ti. The result of the automatic merging was checked by one of the authors. Table 2 presents the final code families as well as the codes they consist of. However, the numbers are suggestive only and a result of our interpretive work in this particular context. The discourses presented in our analysis seem to correspond to more general discourses surrounding the game, but we make no quantitative claims about their prominence outside of this data set. Table 2. Code families relevant to BM in Hearthstone (click to expand). Blizzard made some changes to the game after our initial data collection. In order to validate our conclusions after the updates, we collected another data set in October 2016, using the same criteria as for the original data collection. We compared our findings to the new data, focusing on analyzing how the new "Wow"-emote was perceived. The meaning-making negotiations concerning emotes remained similar across datasets. However, we did not code this second data set in detail but simply checked it against our earlier analysis. Ethical questions related to online scholarship have received a significant amount of attention in the last 20 years since the beginning of internet research. Questions related to data being in the public or private domain, the need to gain informed consent, and the protection of anonymity of participants are prime examples of ethics in research. We followed Griffiths, Lewis, De Gortari, and Kuss (2014) in concluding that the data was in the public domain. The forum the data originates from is shared openly with the general public, without any need to register (i.e. user names and passwords) in order to access the posts. The posts were all written pseudonymously and no "sensitive" information was shared. However, people's perception of whether their interactions are public or private are practically impossible to discern from the outside. Quoting real-life examples of forum posts would have endangered the anonymity of participants, as any reader of the paper could find the original source simply by using a search engine. Instead of using direct quotes, we created composite examples of common ways of discussing issues on the forums (Markham, 2012). This way we could honor the forum participants' discourse without violating their (perceived) privacy. We, as researchers, did not participate in the discussion. We explored the archives of posts chronologically backwards. Thus, it was neither possible nor relevant to introduce the presence of researchers to the forum members. Forum discussions are a rich source of data, but they also have their limitations. While discussing Hearthstone requires at least some familiarity with the game, we had no way of verifying whether or not the forum posters were active players. The participants were also a self-selected group in that they had chosen to participate in forum discussions. They may have, for example, represented a different demographic background than the average Hearthstone player, or approached the game with a different mindset. Over the next section we will go through the key findings from the analysis. We will mostly focus on the code families that directly deal with emotes and BM, as they have the most direct link to the research questions. Although syntax and semantics guide an interpreter's understanding of language, the interpreter needs to be able to account for context in order to understand any actual communication. Even languages as simple as the six-emote language used in Hearthstone are capable of conveying more than the six preset meanings. A "Hello" can be used at the start of the match to greet the other player. But when the other player is taking their time with their turn, a repeated "Hello" can be used to convey frustration at their lack of haste. 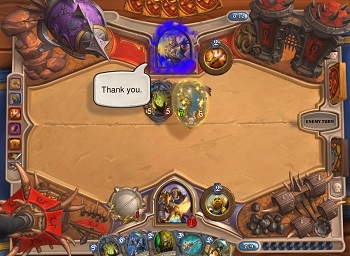 "Thanks" can be used at the end of a match to thank your opponent for a delightful game, but it can also work as a taunt. A "thanks" from your opponent after you make a mistake is hard to construe as anything but mocking (see Figure 2). Figure 2. Anduin Wrynn thanks his opponent after stealing a powerful special character from them (click to expand). An emote also derives different meanings from how it is expressed by the character being played. While Uther states his "Thank you" in a relatively straightforward manner, the same emote is expressed by Rexxar as "Thanks" in a much more ambivalent tone. 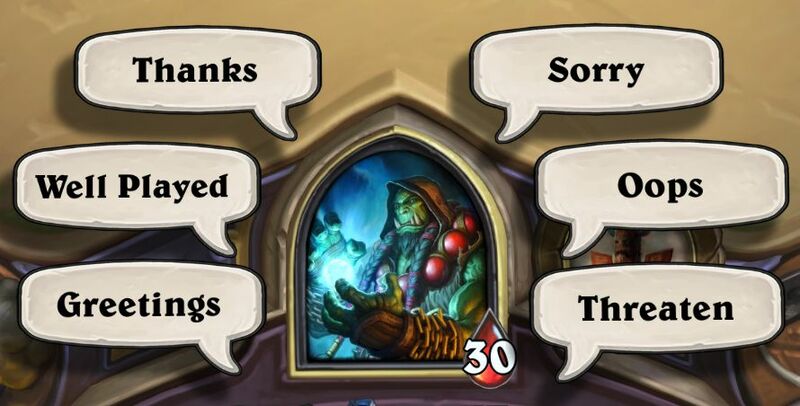 Players aware of these differences in tone can use the emotes in particular ways, for example using Rexxar's "Thanks" in an sarcastic manner. I'd like the emotes if they weren't so incredibly sarcastic. Especially Jaina's "Whoops" is annoying. Forum posters appeared to be well aware of this ambiguity in the emotes' meaning. The data included several threads where users tried to negotiate the meaning of an emote, tried to evaluate how others used emotes, or complained about the ways they were used. Codes related to negotiating the meaning of emotes were among the most numerous found in the data. For example, discussions on who should use the 'Well Played'-emote and when should it be used appered often. I don't mind emotes if you don't spam them. But I hate when people use "Well played" after every game, even if it was not a good game. You won, no need to rub it in. Some posters attempted to define the proper use of the emotes, trying to dispel the ambiguity surrounding the six expressions. These users tried to develop an agreed-upon vocabulary that would make the emotes fixed, removing the contextual interpretation necessary to make sense of the expressions. They argued, for example, that some emotes used in specific contexts should always mean the same thing or be used with the same intention. Other people on the forums quickly disagreed with these specific readings of the emotes, pointing out other possible meanings or their own preferred uses. Unilateral attempts to define the meaning of words quickly run into the social nature of language (Wittgenstein, 2001). Why do you think saying "Well played" as the winner is BM? I always say "Well played" after a game. If you are offended by this, you are just overtly sensitive. Some players also felt that restricting the forms of communication to emotes without the possibility of using chat makes it easier for people to be impolite. This seems like a surprising conclusion, considering how the emote system has been designed to prevent abusive language and negative interactions online. This reading interpreted the situation as being worse, since there is no way to confront the people abusing the emote system. For some posters, the whole emote system appeared uninviting. It seems some players were not interested in seeing what their opponents emote, and always squelched their opponents right at the beginning of the match. These players cited multiple reasons for their choice: they felt that the emotes were mostly used for offensive or negative communication, or that the emotes distracted from playing the game. Some players also acknowledged their own emotional reactions to emotes and wished to avoid those negative experiences. A reappearing theme in the data was the wish for a "perma-squelch" option to be added to the game. I hate people spamming emotes. I just say "Hello" and squelch everyone at the beginning. If I could permanently squelch everyone, I would. Other posters reacted positively to emotes, usually because they felt the emotes were used in a humorous manner or because they found the way a particular emote was voice-acted to be especially funny. For example, the 'Wow'-emote of a special character called Ragnaros, realized as "SO HOT", received multiple mentions in this light. According to the forum posts, the available emotes were used to convey messages of a broad variety, from the simple "Hello" in the beginning of the game to elaborate ironic insults, using timing, contextual cues and knowledge of the game to imbue their emotes with subtle meanings. Still, for many players the available options did not appear to be sufficient, leading to the desire that there were emotes for expressing other, particular sentiments. I don't think a full chat system would work. People already misuse the emotes enough. But sometimes I wish there was an emote for "I can't believe you were that lucky". Analyzing the way players discuss specific emotes, it becomes clear that the choice of including or removing emotes from the game is not inconsequential. For example, some players reported using the 'Sorry' emote after they unintentionally caused the other player to wait, such as when they did not notice the game had begun or that it was their turn. After the patch in which 'Sorry' was replaced with 'Wow', this particular, specific meaning became much more difficult to convey. Others declared 'Wow' to be either well, or best, suited to BM, showing that the change may not have achieved the goal of removing negative experiences from the game. Despite the emotes' flexibility, there seems to be only so much players can convey with the six available. According to the data, when the six-emote-language became too constrained, players used the other affordances of the game to express themselves and interpret others' intentions. In Hearthstone, players are offered several ways of communicating their intentions and experiences to other players, besides using emotes and text chat. They can, for example: play slowly, play all their other cards before using the winning one, or concede in a middle of an even match. These activities can be combined with emotes, to emphasize or alter their message. For example, a player playing their turn until the end, emoting "Sorry" and then conceding can be seen as just realizing that they have no way of winning and apologizing for taking so long to reach that conclusion. Even simple affordances can be used creatively in games (Wright, Boria, & Breidenbach, 2002). One example from FPS-games is using the ability to crouch over the face of a fallen enemy as a means to humiliate them, which in the player communities is called "teabagging" (Salter, 2011). Using too much time while playing the game or intentionally stalling. This was often called 'roping', a reference to the slowly burning rope that appears when a player's turn is about to end. Spamming emotes or using emotes in a specific way. At least the following uses were all defined as BM: emoting "Well played" at the end of a game, especially before winning; emoting "Well played" after every card; emoting "Thanks" no matter the situation. Conceding at the end of a match and not letting your opponent finish you off. In doing so, you rob the enemy of the chance to play the winning turn. Not conceding when it is clear you have lost, forcing the other player to kill you. Quitting the game instead of conceding, although there is no way to distinguish this from disconnects that arise from network problems. Continuing the game when it is clear you have won. Playing cards that are not necessary for winning, and attacking with minions unnecessarily before dealing the final blow. This is related to category 1, since it also wastes time. For some posters it was also BM to overkill your opponent by dealing unnecessarily large amounts of damage on your final blow, when a smaller amount would have been enough. Sending a 'friend request' after a match and then ranting at your opponent (see Figure 3). Posters were wary of accepting these requests, since at least for some players it seemed to be a way of venting frustration at their enemies before removing the target from the friend list, preventing them from answering in any way. Figure 3. A player has sent a friend request to comment on deck choice and luck (RNG) after a game (click to expand). While these were the most commonly mentioned forms of BM in our data, not all players agreed on whether they constitute BM. For example, the norms around conceding were clearly polarized, since both conceding and not conceding were seen as BM. Another example was playing your hand before finishing off your opponent. Some players stated that they prefer when their opponent does this, as it shows what their opponent had in their hand when they won; others thought that the opponent is wasting their time and (intentionally) being disrespectful. It seems that everything I do is BM. If I play all my cards, I'm overkilling the opponent. If I play only the exact amount of damage needed to kill the opponent, I'm giving them false hope. If I don't concede, I'm wasting my opponents time. If I concede, I'm robbing them of the opportunity of killing me. If I emote, I'm a spammer. If I don't emote, I'm being rude. Some users pointed out that it is practically impossible to know the so-called true intentions behind communicative actions, and others reacted strongly against the concept of BM itself, stating that the whole notion is unnecessary – and unnecessarily kept up by the community. Even in a simple game like Hearthstone with relatively strict limits to what players can do in the game, players have different preferences on how to play the game. They make varying interpretations on what is the proper, or the most fun way, to play the game, and view other ways of playing as breaches of a vague Hearthstone etiquette. Finally, a core issue of the problematic nature of the discussion on BM is that the choice of a character or deck can also be seen to be a communicative act. For example, according to the data it is evident that some players felt justified to engage in BM if the other player brought a competitive deck into the casual mode. Other players, on the other hand, reported being aggravated every time they encountered a specific character in the game as their opponent. I only BM when I see that the opponent plays a stupid zoo or face hunter deck. I'll just rope them as much as I can. Hearthstone lacks many of the usual contextual cues of communication, forcing the players instead to focus on the few available forms of interaction. Use of emotes, the rhythm of play, deck choice and mouse movements are all read as subtle hints on what the other player is thinking about or trying to communicate. This leaves a lot of room for interpretation, and the apparent lack of contextual cues does not make this process any easier. The idea of contextual cues (or lack of) has been integral to studies into computer-mediated communication for decades. Early in the research into computer-mediated communication researchers asserted that anonymity and the lack of social context cues could lead to uninhibited and aggressive behavior that would not be so prevalent if the people participating in the activities would make their identities public (Sproull & Kiesler, 1986). In the context of gaming, the knowledge that an opponent is, for example, a child, a beginner, or inebriated, allows us to be more precise in interpreting their behavior. While the reality of contemporary online communication has illustrated that people are perfectly capable of behaving aggressively even when they can be reliably identified, the designers' choice of drastically restricting social context cues appears to be in an interesting juxtaposition to their outspoken goal of promoting a friendly and easy-going atmosphere. Some forum posts also commented on this contradiction, calling for better reputation tracking tools that would allow the game to apply penalties for BM. Our analysis also reveals something akin to the so-called negativity bias (Baumeister, Bratslavsky, Finkenauer, & Vohs, 2001), a tendency for negative information to outweigh neutral or positive information when forming impressions and social judgments of the other party. This phenomenon has also been demonstrated in computer-mediated communication contexts where there is a relative lack of social or emotional cues (Byron, 2008). From a design viewpoint, this means that ensuring neutral or positive interpretations is nigh impossible, or would require a significant positive bias in the game's communication system. Discussions on BM are commonplace on the forums we analyzed – so common that even the participants on the forums regularly comment on their recurring nature. However, these threads are continuously maintained by new posts. Some players do so to mention that they have never, or very rarely encountered BM while playing Hearthstone. Others complain about being BM'ed in every game they play. It is unlikely that their actual game experiences differ that greatly from each other, but their interpretations clearly do. It seems that BM is at least partially in the eye of the beholder. Those players sure that BM is commonplace easily find confirmation for that belief, leading to an experience where every game is filled with bad manners. Those players convinced that BM is rare seem to find ways of interpreting their opponents actions in a more benevolent manner. It is possible that there are different interpretive communities (Fish, 1976) within the player community that have a more or less uniform understanding of how the communication should be interpreted. These communities might be formed, for example, by players with a certain amount of experience with the game or placement in the ladder (players of a certain rank usually play against players of similar rank). Players following the same popular streamers on Twitch.tv or similar streaming platforms and taking their interpretive cues from how streamers use or understand emotes and game behavior may also form communities. Similar to studies concerning other multiplayer games, our analysis shows that one interpretation of the vibrant discussions over the meanings and uses of emotes is that "[t]he culture cares deeply, not only about the game being played, but also about how it is being played, and the gamers playing it" (Elmezeny & Wimmer, 2015). Through continuous negotiations over symbols and their meanings, players take the game beyond its origins, and create a culture around it. Whether the larger player community can, or even wants to, reach a consensus concerning BM might not be as important as the issue that BM offers a recurring theme that can be returned to, over and over again, as a part of the community's functioning. Players in our data seem to have adopted one key feature in fostering sustainable user communities online – the ability for members to not only form their own groups, but also to self-regulate them (Cheng, Farnham, & Stone, 2002). After all, Hearthstone itself does not allow for interactions at either group or community levels, nor does it allow the kind of negotiations over shared meanings that our data shows. However, BM is also a real phenomenon. Many forum participants admit that BM is a behavior they at least occasionally participate in. "Justifying own BM" is among our most used codes. Often, the reason is found in the opponent: they BM'ed me first, so I might as well BM back. Considering that what constitutes as BM is so reliant on the players interpretation, this might lead to unfortunate cycles of "you did it first". One of the justifications given for engaging in BM relates to the opponent playing a certain deck or class. At the time of the original data collection, the hunter class was especially hated because the most popular deck was based on the idea of winning the match before the opponent could react in a meaningful way. Many players experienced this as frustrating, and they felt justified in BM'ing against anybody who played a hunter deck (labeled as "huntard" in the forum discussions). Other forum participants openly state that they enjoy BM or feel that it is part of playing the game well. Making your opponent lose their cool will make them play worse, so it may be beneficial to upset them. These players did not consider it an ethical issue, but a matter of strategy. These different norms are revealed even on the highest levels of play. Competitors of the Hearthstone Dreamhack 2014 tournament, for example, stated "Well played" after an even match and emoted "Sorry" to their opponents when they were lucky and drew a winning card in a key moment of the game. The eventual winner, with the pseudonym Firebat, also engaged in behavior that was interpreted as BM by the casters by bluffing that he could not finish his opponent off before revealing a card that won him the game. players intentionally misbehave in order to upset their opponents to gain a competitive edge. The study shows that Hearthstone's designers' intent of removing negative experiences is difficult, if not impossible, to realize for two prime reasons. First, players will always try to interpret their opponent's actions regardless of how restricted are the communicative affordances. Secondly, the game designers are unable to fully eradicate those chance moments during play when misbehavior is possible. Of course there are differences as to the extent to which social interaction plays a part in the overall design and feel of the game. But avoiding all of the pitfalls of (negative) social interaction in a game like Hearthstone is not really possible. However, the designers can affect the amount of BM by designing the game in a way that minimizes the amount of decks that cause annoyance. This is possible by following discussions of different deck types on popular forums. This study contributes to our understanding: 1) the dynamics of computer-mediated communication in situations where communicative affordances are restricted, 2) the way negotiations concerning meanings tie in with the process of community creation, 3) the issues of interaction design related to creating communications systems that lead to positive player experiences. Our analysis contributes to the growing literature on nonverbal communication (NVC) in technology-mediated contexts in showing how NCV continues to be a meaningful part of even abstract and highly restricted interactive systems. It is understandable that research into online multiplayer communities has at times highlighted the importance of shared space in creating and maintaining a sense of community (Ducheneaut, Moore, & Nickell, 2007). However, the case of Hearthstone serves as a reminder that persistent, complicated 3D environments or photorealistic avatar bodies are not required for NVC. As Manninen (2003) points out: "Rich interaction does not necessarily require rich interfaces." At least some players care deeply enough about the culture they are participating in while playing to also discuss the game in the forums. Discussions, arguments and simple emotional venting about the proper ways of using emotes and correct behavior while playing keep recurring in the discussion threads. Our analysis highlights how game design and overall interaction design can intertwine. This case study of Hearthstone illustrates how there may be a certain kind of "natural" evolution to (nonverbal) communication in virtual spaces that is difficult or impossible to predict. The study also reminds us that in this type of contexts there has to be an underlying design, from which a social order emerges. The next phase, Ventrella (2014) argues, is a balancing act of "setting down the tools and their constraints, watching how people use them, and refining those tools (or discarding them)". This is exactly what we have seen in the case of Hearthstone and with the evolution of the game's available emotes. Future research might explore mapping out different player groups and their interpretive strategies across a variety of multiplayer online games. Players who feel they encounter BM in every game and players who report never seeing it have sharply divergent ways of interpreting the game that could relate to other things, like personal history, personality, familiarity with similar games or experience with Hearthstone (Peña & Hancock, 2006). Matching players with similar interpretive strategies against each other could lessen clashes between players and possibly lower the overall rate of BM in the community. This research was supported by the Academy of Finland projects Ludification and the Emergence of Playful Culture (Ludic, 276012) and Centre of Excellence in Game Culture Studies (CoE-GameCult, 312397). This research was also supported by the TEKES research project Hybrid Social Play: Solutions for Future Social Games and Media. The authors want to thank Samu Voutilainen for his help in data analysis. We manually removed hits related to Blackrock Mountain, an adventure expansion to Hearthstone. Baumeister, R. F., Bratslavsky, E., Finkenauer, C., & Vohs, K. D. (2001). Bad is stronger than good. Review of General Psychology, 5, 4, 323. Blizzard Entertainment. (2017, May). 70 Million Players!. Hearthstone official site. Retrieved March 23, 2018, https://playhearthstone.com/en-us/blog/20720847. Blumer, H. (1973). A note on symbolic interactionism. American Sociological Review, 38, 797–800. Byron, K. (2008). Carrying too heavy a load? The communication and miscommunication of emotion by email.. Academy of Management Review, 33, 2. Cheng, L., Farnham, S., & Stone, L. (2002). Lessons learned: Building and deploying shared virtual environments. In The social life of avatars (pp. 90–111). Springer. Curtis, P. (1996). Mudding: Social phenomena in text-based virtual realities. In High noon on the electronic frontier: Conceptual issues in cyberspace (pp. 347–373). Elmezeny, A., & Wimmer, J. (2015). How gaming achieves popularity: The case of The Smash Brothers. In Proceedings of the 2015 DiGRA International Conference. Griffiths, M. D., Lewis, A. M., De Gortari, A. B. O., & Kuss, D. J. (2014). Online forums and solicited blogs: innovative methodologies for online gaming data collection. Studia Psychologia, 14, 3, 5–24. Manninen, T. (2003). Interaction forms and communicative actions in multiplayer games. Game Studies, 3, 1, 2003. Miles, M. B., & Huberman, A. M. (1984). Qualitative data analysis. Beverly Hills. Ca: Sage. Namey, E., Guest, G., Thairu, L., & Johnson, L. (2008). Data reduction techniques for large qualitative data sets. Handbook for Team-Based Qualitative Research, 2, 137–161. Philippette, T., & Campion, B. (2013). On Justification: WoW, EQ2 and Aion Forums. Well Played, 2, 2, 59–78. Salter, M. B. (2011). The Geographical Imaginations of Video Games: Diplomacy, Civilization, America's Army and Grand Theft Auto IV. Geopolitics, 16, 2, 359–388. Sproull, L., & Kiesler, S. (1986). Reducing social context cues: Electronic mail in organizational communication. Management Science, 32, 11, 1492–1512. Sweetser, P., & Wiles, J. (2005). Scripting versus emergence: issues for game developers and players in game environment design. International Journal of Intelligent Games and Simulations, 4, 1, 1–9. Trubshaw, R., & Bartle, R. (1978). MUD1. [Platform independent], Colchester, Essex. Ventrella, J. (2014). The future of avatar expression: body language evolves on the internet. In Nonverbal Communication in Virtual Worlds (pp. 345–352). ETC Press. Walther, J. B. (1993). Impression development in computer-mediated interaction. Western Journal of Communication (Includes Communication Reports), 57, 4, 381–398. Warner, D. E., & Raiter, M. (2005). Social context in massively-multiplayer online games (MMOGs): Ethical questions in shared space. International Review of Information Ethics, 4, 7, 46–52. Wittgenstein, L. (2001). Philosophical Investigations: The German Text, with a Revised English Translation. (G. E. M. Anscombe, Ed.) (3rd ed., pp. x, 246). Oxford: Blackwell. Yee, N., Bailenson, J. N., Urbanek, M., Chang, F., & Merget, D. (2007). The unbearable likeness of being digital: The persistence of nonverbal social norms in online virtual environments. CyberPsychology & Behavior, 10, 1, 115–121. Blizzard Entertainment. (2004). World of Warcraft. [Microsoft Windows, macOS], Irvine, California: Blizzard Entertainment. Blizzard Entertainment. (2014). Hearthstone: Heroes of Warcraft. [Windows, macOS, iOS, Android], Irvine, California: Blizzard Entertainment. Thatgamecompany. (2012). Journey. [PlayStation 3, PlayStation 4], Tokyo, Japan: Sony Computer Entertainment.